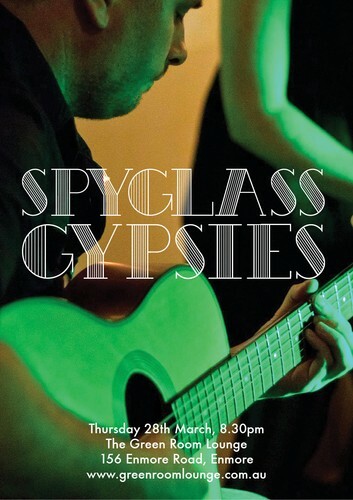 Spyglass Gypsies’, a 4-piece French gypsy-jazz and swing group that specialise in the manouche style of the 1930′s-40′s. Formed in 2010, the group have been performing regularly around Sydney, particularly in the Inner West and are well suited to smaller sized venues such as the Green Room. An all acoustic group comprised of guitar, accordion, clarinet and bass, their music is energetic and playful and full of nostalgia from the swing and war-time eras.